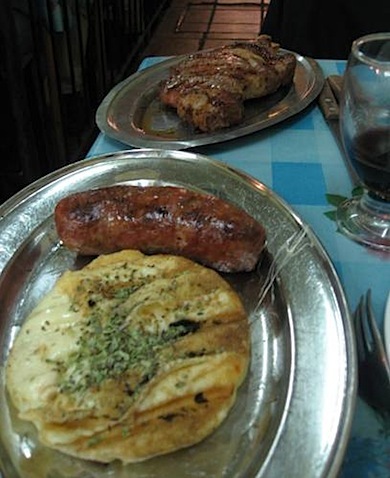 On our extended stay in Argentina, we were very excited to sample the Argentine cuisine. One of my favorite ways to get to know a destination is by sampling its foods. 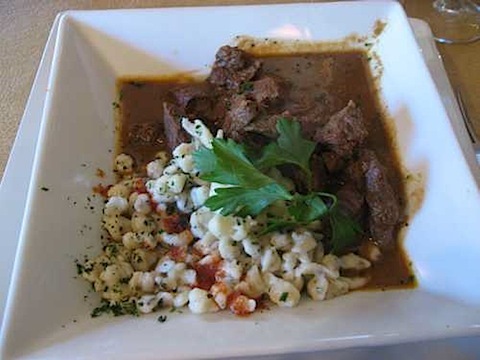 Argentina is a huge country, and it has remarkably good Argentine cuisine like steak, stellar ice cream, mouthwatering pastas, and dozens of other savory items I’d never tried before. It’s been a delicious, belt-busting ride. Wondering what people eat in Argentina? Here’s our summary of the best Argentine cuisine. Read to the end to see the top drink, our #18 pick. There’s much more to Argentine cuisine than steak, but Argentine’s eat beef like it’s their job, and it’s easy to see why. It’s high-quality, tender, delicious, and far less expensive than it is in the United States. 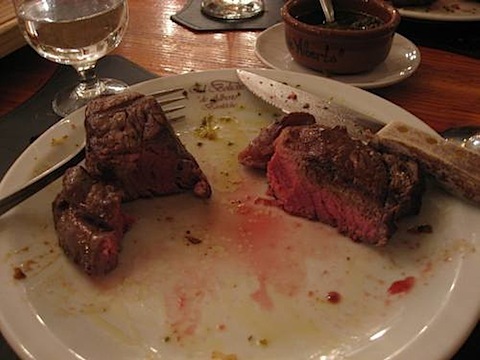 You will easily find an Argentina parrilla, a restaurant that specializes in steak, because they are plentiful here. There are so many cuts of steak offered that it is easy to get overwhelmed when you look at a menu. After being here for over two months now, I can say with confidence that grass-fed beef definitely tastes better. If you’ve traveled in the southern US, you might have tried chicken fried steak, steak that’s battered and fried. A milanesa is similar, but very thin, a bit tougher, and more lightly breaded. Milanesas often come on sandwiches, and the steak can be replaced by other meats. 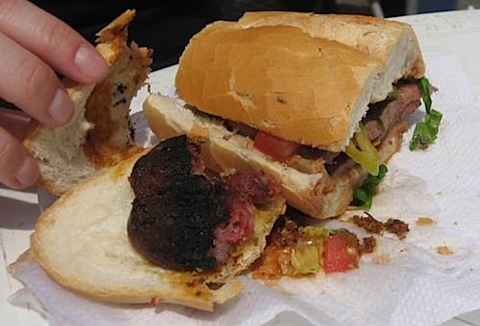 A choripan (on the left in the photo below) is a tasty sandwich made of chorizo (sausage) and pan (bread). Add a little chimichurri sauce and you’re in for a treat. It’s simple and delicious. Lomitos are amazing steak sandwiches with lettuce, tomato, and whatever sauces you decide to add. You can also get a lomo completo (or lomito completo), which usually comes with cheese, ham, and egg on it. The best lomito I had was just outside the nature reserve in Buenos Aires. These tasty little sandwiches are layers of ham, cheese, and very thinly sliced bread. We made the mistake of getting too many for a bus ride and got sick of them. But the ones we had were good. Argentines eat them as a snack between lunch (at 1pm or 2pm) and dinner (at 9pm or 10pm). They’re always homemade, even in restaurants, and generally inexpensive. 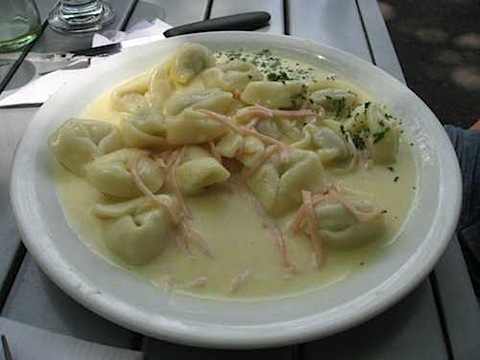 We’re tried everything from gnocchi to ravioli to tortellini in cities across the country. If you’re ordering pasta in Argentina, look closely at the menu. Oftentimes, the pasta itself has one price, and the sauce costs extra. 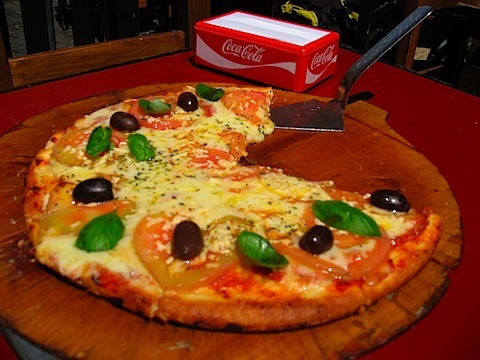 Did you think you would be eating pizza in Argentina? You can definitely see the Italian influence when you walk down the street in any Argentine city — there are pizza places everywhere. And it’s not Domino’s-style, either. It’s homemade, well-seasoned, and delicious. The great thing about pizza is you can get it any time of day. So if you don’t want to wait to eat dinner until 9pm like the locals do, you can order a pizza instead. The quality, style, and flavor of empanadas vary from region to region. These delicious pastries can be filled with meat and olives, ham and cheese, spinach, corn, and even apples. With the exception of the sub-par one I had in Iguazu Falls National Park, the empanadas I sampled were quite delicious. 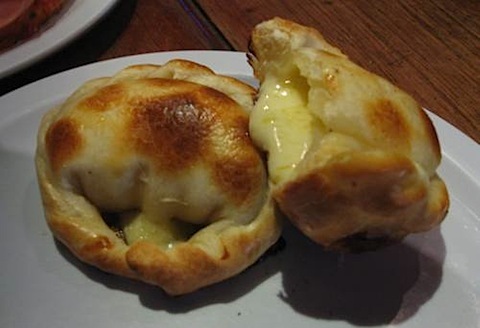 My favorites were the roquefort one (below) I had in Buenos Aires and the many flavors I tried in Trelew. 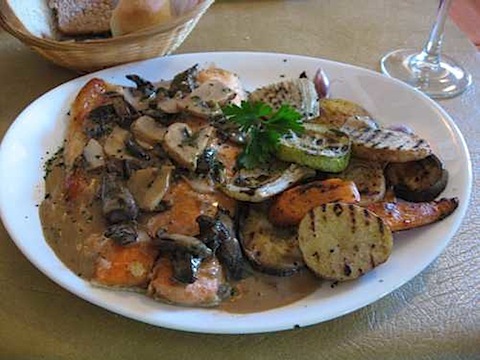 In the Lakes Region of Argentina, trout is a local specialty. It’s generally more expensive than we like our meals to be (though still not as much as it would be in the US), so we only tried it once. The dish we ordered came with a mushroom sauce and a side of amazing grilled veggies (a welcome alternative to french fries). It was delicious — one of the best meals we had in Argentina. Growing up in Texas, I’ve had my fair share of quality venison. But the deer meat we ordered in San Martin de los Andes was some of the most interesting, most tender venison I’ve tasted. It was served with spaetzel, which was a nice compliment. 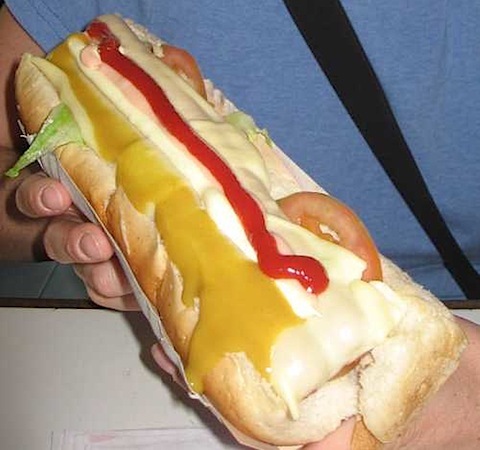 I’m not sure this qualifies as a national food of Argentina, but there are pancho (hot dog) restaurants all over country. Curiosity got the best of me in Mendoza, and I decided I had to know what the fuss was all about. I ordered this super pancho, complete with lettuce, tomatoes, and cheese. The taste was good, but I felt a bit sick afterwards. 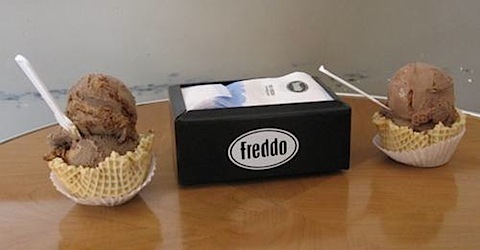 The helado (gelato-style ice cream) in Argentina is some of the best ice cream I’ve ever had. It’s creamy, rich, and delicious. Plus there are tons of flavors, and you don’t have to pay extra to get more than one on your cone. Argentina has some of the best baked goods — from cookies and cakes to bread and scones — I’ve ever had. The country is well-populated with panaderias (bakeries) where you can get them fresh, so it’s no wonder that Argentine’s eat more sweets per capita than anyone else. Restaurants serve fresh bread, which they’ve either baked themselves or bought from a nearby panaderia. Croissant-like medialunas come in two varieties — plain and slightly sweet. When they’re fresh, they’re quite good. But since these compose the main (and usually only) course of an Argentine breakfast, I’ve had my share of mediocre medialunas in hostels and cafes. Bariloche in Patagonia is the chocolate capital of Argentina, which you’ll know after just one walk down the chocolate shop-covered street. We sampled a lot of chocolate in Bariloche, and I especially enjoyed the more exciting flavors like mint and honey. But I have to say I still like Russian and German chocolate the best. This thick, sweet, milky sauce falls somewhere between jelly and caramel. It’s hugely popular here. Argentines eat it on bread and medialunas, but you can also find it in cookies and ice cream. Personally, I think it’s a little too sweet, but some people love it. Argentina is known for these cookie sandwiches, which usually come filled with dulce de leche. The best ones are from a bakery, but you can also get them pre-packaged in supermarkets. 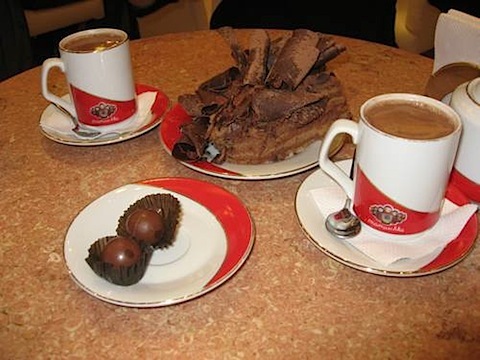 The best version I had was from a bakery in Buenos Aires and was dipped in white chocolate. Something interesting about alfajores is they’re not just desserts. The buses in Argentina serve them with coffee as a sugar-filled breakfast. Argentina doesn’t have a ton of variety in its cuisine. Spicy food, for example, is nearly impossible to find. But it sticks to what it does best — mouthwatering steaks and sandwiches, delicious pizzas, and sensational baked goods — and will satisfy any foodie’s cravings. Want to try your hand at Argentine cooking? Treasured Recipes from the Nine Regions of Argentina and Seven Fires: Grilling the Argentine Way. What do people in Argentina eat? We listed the must-try foods and the best of Argentine cuisine… but we couldn’t forget the must-try drink. Walk down any street in any town in Argentina at about 3:00 in the afternoon and you’ll see someone pouring hot water from a thermos into a gourd, drinking it through a straw, then passing it to a friend who repeats the process. They’re drinking yerba mate (pronounced mah-tay), a bitter herb that’s high in caffeine and is brewed like tea. It’s usually consumed from a hollowed-out gourd, though some people drink it from tiny metal mugs. You drink it through a metal straw-like utensil (called a bombillo) that has a filter on the end so the mate leaves can’t get through. It’s almost always shared with someone else. Drinking mate is a social activity and offering mate to a stranger isn’t uncommon. Teenagers sit in parks passing around a gourd, just as elders share it on porches. It’s the perfect way to pass siesta, the break everyone goes on from 12-5 pm. After two weeks in Argentina, we couldn’t resist the urge to try mate for ourselves. We bought a gourd and bombillo from a store in Rosario, then headed to the market for yerba mate and a thermos. We searched online “how to drink mate” and read that you have to cure a mate gourd before you use it, so we waited impatiently for two days while our gourd cured. When it was finally ready, we were nervous. We’d read all about how mate has an incredibly strong flavor and is an acquired taste. But we didn’t give up. We found that adding sugar, as some Argentines do, helped with the bitterness. And the more water you add, the weaker it gets, so we started watering down our mate even bit. We shared mate with others on occasion, with people who worked at hostels and a tour guide. 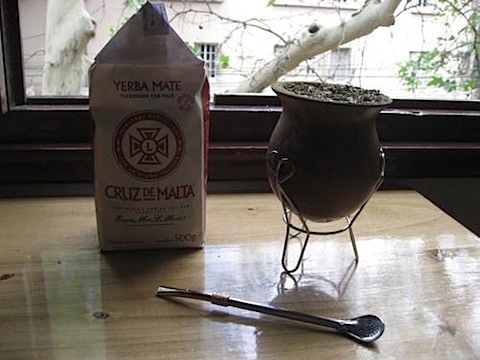 Perhaps yerba mate, with its high caffeine content and herbal benefits, will become a trend in the US. I like to think that I eventually acquired a taste for it, even though that first sip always had more bite than I expected. I’m glad we gave yerba mate a try. Like the other foods on our Argentine cuisine list, this really is part of the ultimate Argentine experience. After sampling typical, authentic Argentine cuisine and trying yerba mate, we felt so much more a part of the culture and less like a tourist. 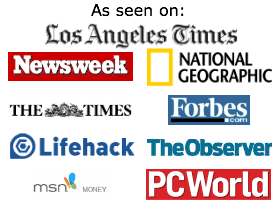 Here are some other articles about our travels in Argentina and South America. Wow – this food looks amazing. You’re right, the way to get to know a place is to sample the cuisine. This will be great to share with my readers. Thanks for the information. You can never go wrong with the steak! All the food looks so good, the Choripan is particular sound delicious. The panchos looks like some kind of super hotdog! Hey, I love this website! I gave my wife a high-five when I read all the delicacies from Argentina. I want to sample all of them! Brought back a lot of memories! Necochea (not far from Mar del Plata) has a huge candy industry as well, I never went to Bariloche, but sweets marked “Bariloche” are available all over. I stayed at a place a half block from a dulce de leche factory in Bahia Blanca, and agonized over the aroma of carmelizing milk every morning I was there. A couple other sweets I’m definitely looking up next time I go back: Dulce de membrillo – like a hardened jam made out of quince, we ate it on bread or medialunas. The other is “mantecol”, this is a candy similar to the filling of “butterfingers”, but a little less sweet and more nutty. Thanks for the comments! The food really was amazing. My mouth is watering just thinking about the amazing pasta, gelato, and steak. I hope everyone gets a chance to try it! Great selection of Argentine foods! I’m an Argentine native and I can’t think of anything you left out, only quince jam and quince jelly which someone else mentioned in their posts. And elderberry jam, which is huge in the South and very hard to find in the States. I bring quite a few with me every time I visit. I’m in South Florida and was lucky to find a small ice cream shop that is run by a couple from Argentina and they make gelatto the way we have it down there. Yum!!! Must be this diet I’m in that made me read this post. Thanks for sharing this! Coney Island hot dogs from Detroit are the best! Woot! Hi! 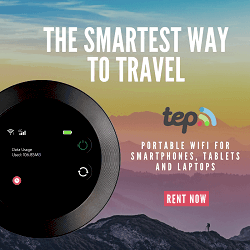 guys and thank you for visiting Argentina, I live in Buenos Aires and it`s true we have great quality in food, you can find here any kind of meals, oriental, spanish, italian, russian, danish, german, thai, japanese, and more. Chocolate en rama in Bariloche its great it melts in your mouth. You also have to try humitas en chala, tamales, puchero, mondongo, matambre, mollejas, morcillas, locro, and so much more. thank you both for such a kind description of Argentina and come again soon! I would like a recipe for empanada gallega.Please, e-mail me one at the above address. Half of my family is Argentinian and on our last visit I actually tried some of these dishes. I love the medialunas! I am an argentine living in spain and miss all this food a lot. It has much more flavor than spanish food, its the quality of the land surely. Ah, coffe (italian style), milk, cheese, fruits etc, the best on earth.